Curb that craving for Thai food without picking up the phone or leaving the house. There’s no need for takeout with this recipe! These favorite Thai seasonings make a great alternative to store-bought curry paste. Feel free to adjust the spices to your liking. Remove outer layers from lemon grass, exposing inner purple stalk. Mince lower halves of stalks (you should have about 1/3 cup). Place minced lemon grass in food processor with onion, cilantro, gingerroot, fish sauce, jalapeño, garlic, coriander, sugar, and lime peel. Cover and purée. Transfer purée to a 4- to 6-quart slow cooker. Stir in coconut milk. Heat oil in a sauté pan. Brown chicken pieces on all sides, half at a time, in hot oil. Add chicken pieces to slow cooker. Cover and cook on low-heat setting about 3 hours or on high-heat setting for 1 1/2 to 2 hours. Stir in sweet pepper. Cover and cook on high heat setting 15 minutes more. 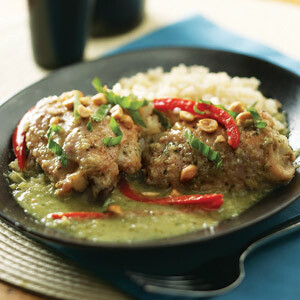 Serve chicken and sauce on rice; sprinkle basil and peanuts over each serving. To make the green curry sauce, purée Thai seasonings with fish sauce in a food processor. Brown chicken to add color and flavor. Pieces should still be pink on the inside when added to the cooker.